The intricate work of South Korean artist Ilhwa Kim is on display at London's House of Fine Art Gallery. 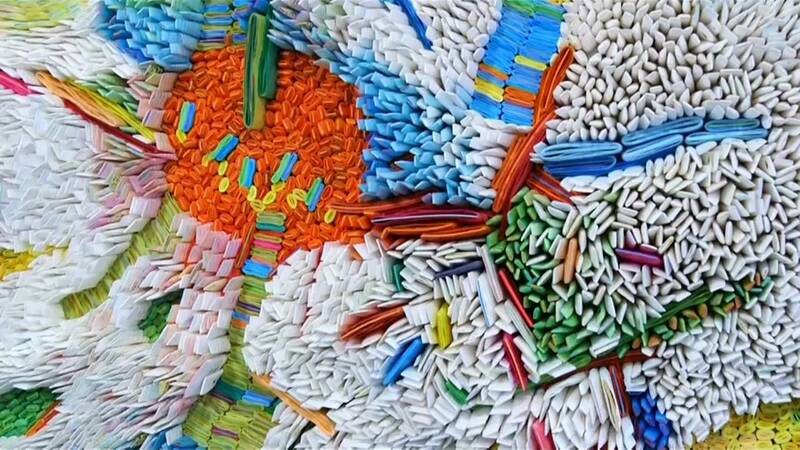 She creates her stunning works from thousands of paper rolls. Made from Korean mulberry paper known as "hanji" Kim then dyes them in various vivid colours following ancient traditions. "It's about separate pieces and the coming together of thousands of pieces," Kim explains. "Each piece represents a world of its own, and when thousands of worlds come together it becomes another universe. There are straight lines and circles and when you combine them together they represent the tiniest particles of the world and I see these as the seeds of the world. They look a lot like seeds too when you look at them from high above." Ilhwa Kim has shown her work in numerous exhibitions and international art fairs around the globe - now you can see her exhibition "Sensory Portrait" at the HOFA (House Of Fine Art) Gallery in London's Pall Mall until April 17.